Another great piece of glass art from Grace Glass will leave you speechless! Made of a high quality borosilicate glass, this Saxo Bubbler is intended exclusively for oil users. 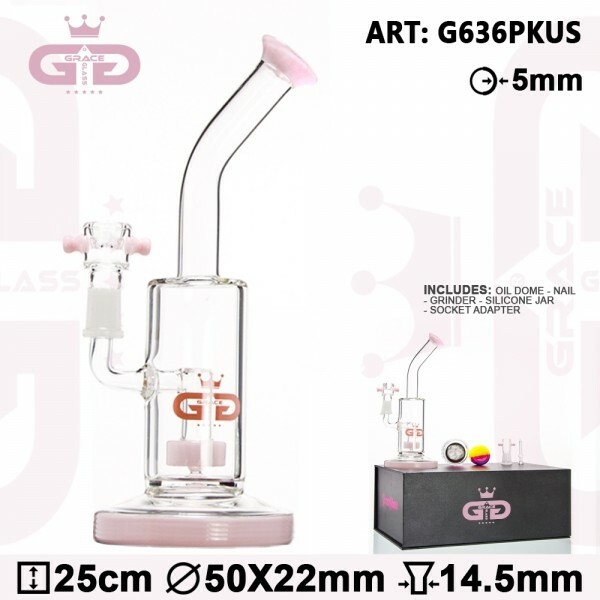 An inside drum percolator will break up your smoke before it reaches your mouth through the fascinating bending neck that will offer you a comfortable grip. The pink Grace Glass logo features at the front of the flatbottomed tube. The whole set-up is delivered inside a box, including a 2 point oil dome, a nail, a grinder, a silicone jar, tips, screens and a socket adapter.